I've had it. You have, too. A cold snap here or there, is OK. But for two months and more? Stop it, already. Seriously, it’s not even fun anymore. I want spring to arrive, and finally be able to venture outside for my morning runs without freezing to death and risking my life on those icy sidewalks. I’m sorry guys but today I’m upset and I needed to vent in some form. At first, I didn’t even want to watch the finale — it was some sort of lame attempt not to acknowledge that the show was about to end. Some sort of ‘TV bandwagoning’ (i.e., watching the finale of a show without seeing a single episode of the series.) On a side note, if you haven’t done TV bandwagoning before, please do it, it’s a lot of fun. Anyways, after long debating with myself I decided to watch the finale, because it was the mature thing to do. It beautifully summed up seven of the best seasons of sitcom television. It's sad to say that I'm going to miss those goofy characters and, the brilliant, topical and hysterical writing. To be completely honest with you I may or may not have sobbed through the episode. Probably not, but it totally felt like I was. And today...today it’s still freezing outside and I’m Park & Rec-less. Major bummer. In order to lighten up my mood and make my mind distract from what is currently happening in my life I’ve decided to pretend it’s summer. At least when it come to meal preparation. I’m all about eating seasonally, but after months of cold, depressing weather and with no more shows worth watching on TV, I needed a change. So I bought zucchini, avocados, cherry tomatoes, and fresh basil at the local grocer, and made some super summer creamy avocado pesto to serve over zoodles. And while I was eating, I pretended I was on a Caribbean beach, just for a moment. Well this entire post has been pointless. Sorry about that. The whole point of it is that the creamy avocado pesto is to die for. Mmmmm creamy pesto and zoodles. Just sounds delicious. And it was. I ate all of it by myself. 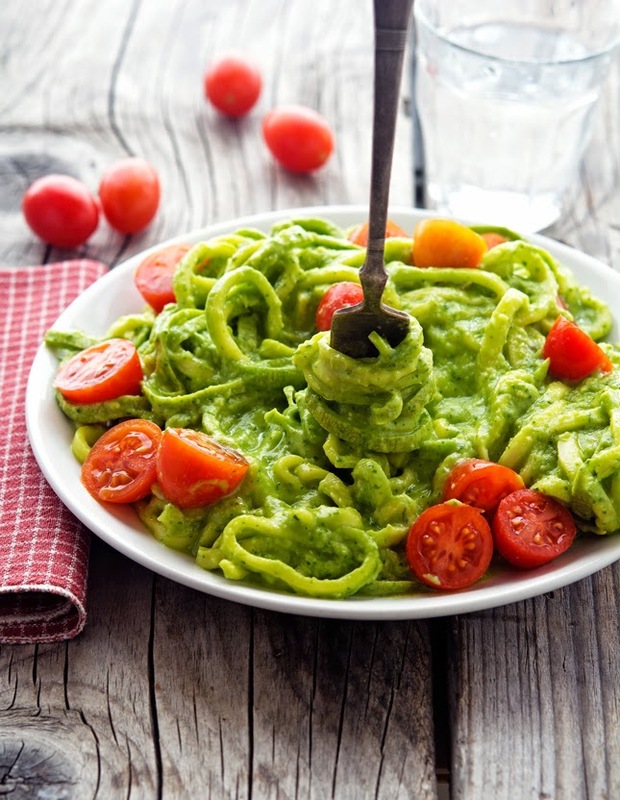 Creamy Avocado Pesto Zoodles Print this recipe! Note. Since avocados oxidize quickly the pesto is best served immediately. 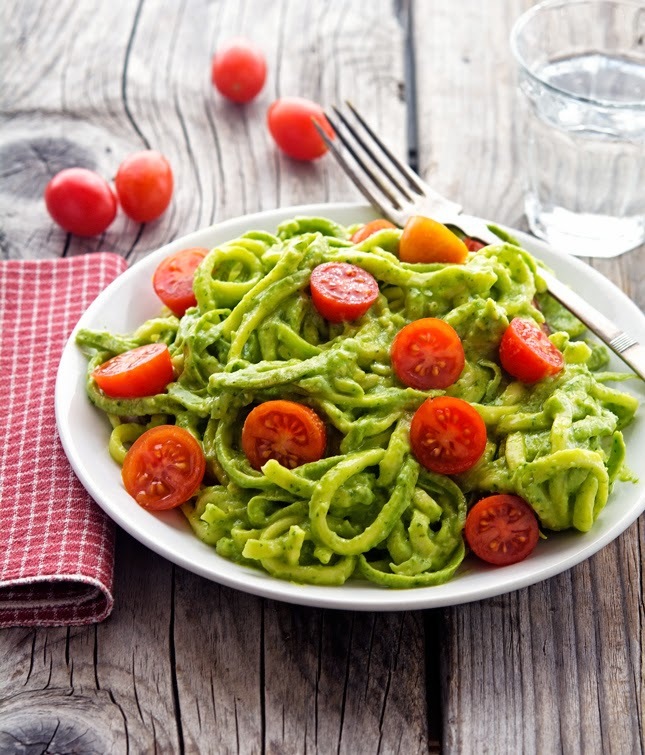 Leftover pesto can be stored in the refrigerator in an airtight container for up to 1 day. In a food processor combine garlic, pine nuts, and basil and pulse to mince. Add lemon juice, avocado, oil, and 1 tablespoon of water. Process until completely blended and creamy, stopping to scrape down the bowl as needed. If it’s too thick add more water, one tablespoon at a time. Take a taste and adjust seasoning. Place the noodles in a covered microwave safe dish and microwave them on high for about 2 minutes. Alternatively, you can cook them in boiling water for 2 minutes. Transfer zoodles to a large serving bowl, add pesto and halved cherry tomatoes and mix well. 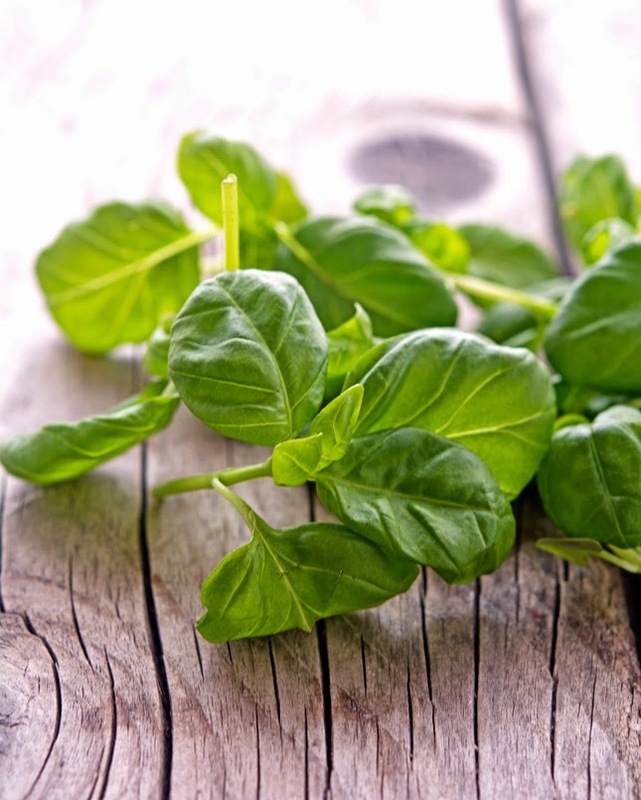 One serving yields 269 calories, 19 grams of fat, 25 grams of carbs, and 8 grams of protein. I have yet to watch the finale, but it's on my DVR. I'm heartbroken. I don't want it all to be over. I'm going to miss everyone. Except Councilman Jamm. This recipe sounds amazing, though. LOVE ZOODLES! Mmmm, I'm not the biggest fan of zoodles, but I bet this would be great over some spaghetti squash or spelt noodles! Where are you at, btw? For some reason I thought CA, but probably not if it's still so cold! I hope it warms up soon for you! Ok, I might even be able to get hubby to eat avocados with this recipe. Yum. I'm right there with you - I've completely had it with winter this year! Last week I bought asparagus, strawberries, and raspberries totally diving off the spring fever deep end! That's the right way to do it K, buy spring produce in the hope that spring will eventually arrive! 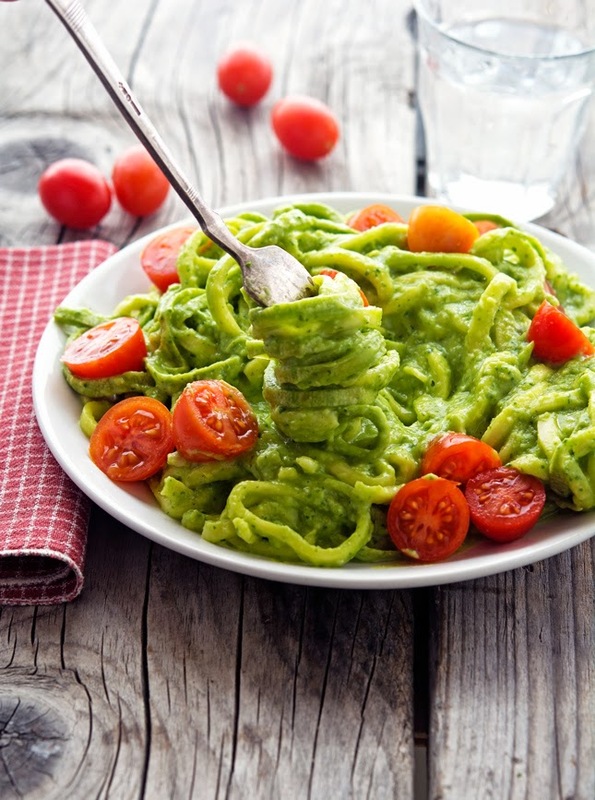 That creamy avocado pesto is definitely to die for! My cousin posted pics of a Frozen Hudson river yesterday - boyoboy, y'all got hit hard with this nasty cold weather! All this cold weather & summer eats so make me look forward to the 60's the weathermen are promising us Atlantans next week! 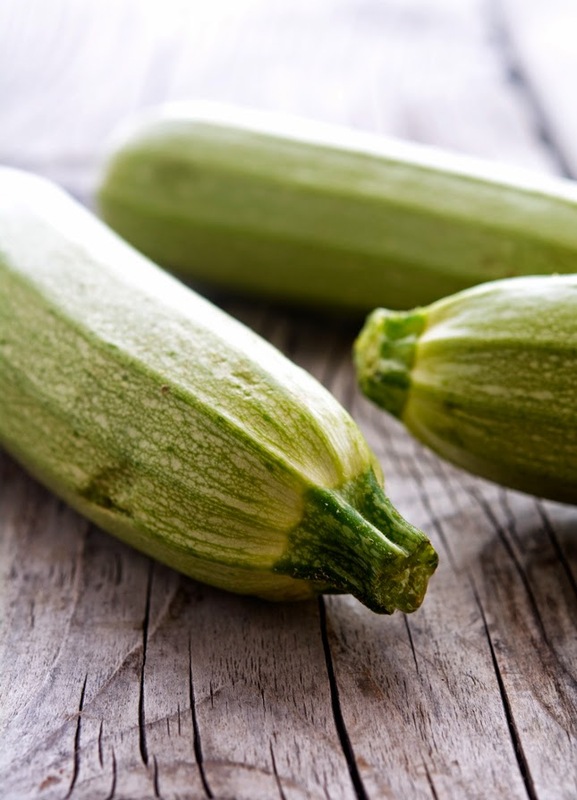 I've never been much of a zucchini fan... but after seeing this post Mike you may have converted me! 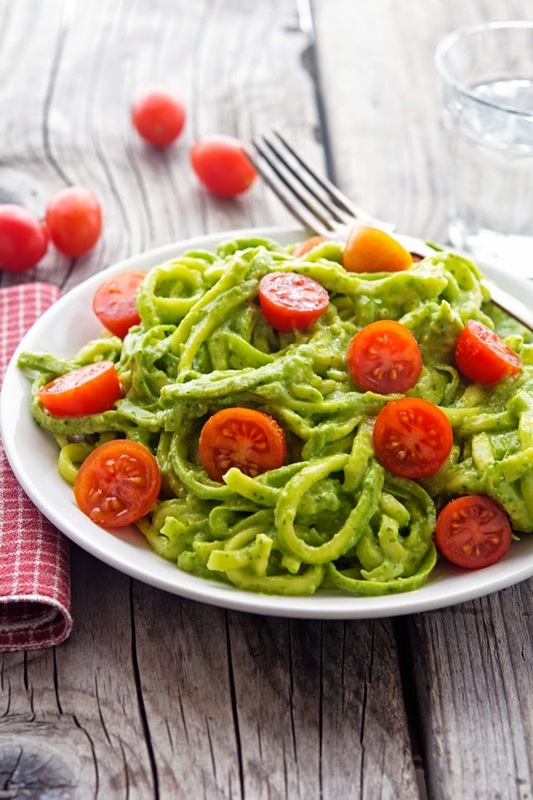 Looks delicious and I love all that creamy avocado pesto sauce. The pesto is to die for T, to die for! Oh my goodness! This looks incredible Mike! I can always count on you for a healthy unique recipe that tastes delicious! LOVE it! Pinned! This looks so yummy and totally a perfect fix for the winter blues - so fresh and healthy! Love it! So easy, quick and light! It's the best cure ever for the winter blues, it's like summer on a plate! The spiralizer is soooo much fun indeed! It's the best G, truly the best! I LOVE Parks and Rec and am so sad it's over. Do you have Netflix/have you seen House of Cards? New season out this weekend, and I'll be binge watching that! Am I repeating myself by saying that this recipe looks amazing? And those photog skills are blowing mymind! I've seen House of Cards, it's reeeeally good! So...I was having a discussion with my sister on a new TV series to watch. She suggested one of the housewives franchise, I said Law and Order. Maybe we need Parks and Rec seeing as you've mustered all 7 seasons! You make those zucks look like pasta. Talented, mate! Law & Order SVU is really good (I didn't care for Law & Order) but it's a police drama. P&R is brilliant comedy, really fun and entertaining, You should give it a shot man! You need a spiralized Tracey, it's one of the most fun kitchen gadgets ever and super cheap too! This looks absolutely super-yummy! I really would like to try it! So I never got on the Parks & Rec bandwagon. I watched an episode here and there, but perhaps I need to go back and watch some archives. Maybe while I'm eating this avocado pasta? I'm seriously digging the fresh summery vibe of this dish. I need it in my kitchen asap...maybe it will help melt the snow outside! I love the creaminess that avocado brings to any dish. Can we still be friends even if I haven't watched a single episode of Parks & Rec? And more importantly, that I've never had zoodles? Ok am I late because I just noticed your blog redesign!! It's gorgeous Mike. So full of light and your pictures are so stunning too!! I wish I was eating this for lunch!! You had me at avocado. Yummmm. I think I need to treat myself to this soon! Hi Mike, I think we all want what we do not have, here in Arizona, it is in the seventies, how I wish for cold weather, or a weather change. Love this recipe...avocadoes are my favorite! Just served this delish dish last night and I was so amazed that my meat loving hubs was singing its praises and heading back for more! This will definitely go in the revisit repertoire along with several other yummy recipes you've shared. Thanks so much for the inspiration. Your blog has been a great help in our pursuit for a healthier lifestyle. Keep up the great work! Looking forward to trying this one! Do the pine nuts have to be toasted or anything? Also, I have a small hand spiralizer - would you have a recommendation for one of the larger ones for when I want to make a lot but not break my wrist, lol? I make zoodles all the time, and I have to say the photo is of real pasta and not zoodles. It's a bit misleading. The dish doesn't look half as nice as it would with real pasta. Sorry to disappoint you Kristina but those are 100% zoodles. In fact, I wound never take a picture of something different from the recipe. That's just something I'd never do!